The marvelous, bigger-than-life character Donald Trump conveniently inserts his foot in his mouth and enrages the 99 percent of us. He does this just to throw raw meat to his one percent buddies. Boy, you can’t make this stuff up. The whole “birther” controversy is simply another right-wing smokescreen. The naïve liberals keep convincing themselves that the Obama/Biden ticket cannot lose in November. Like a good movie script, we “fade” to the Headquarters of the brain trust of the Conservative Party…the Greatest…Sir Karl Rove…(applause please…please) “boy, do we have them guessing again,” Karl is saying with that boyish all-over-your-face chagrin grin, “my statistics show that, once again, if we just win three of the five “bible belt” precincts near Toledo, we can win the delicate-rich Ohio! “We’re already planning, long range, on how to marginalize VP Joe fumble-mouth Biden while simultaneously carefully vetting and more carefully, grooming the John Kennedy-like fresh, bright-eyed savior of the Grand Old Part…Mark Rubio.” This kid is unflappable, he-man handsome with a remarkably compelling story of survival and living the American Dream. Okay. You have to keep your mind sharp like a game of chess. 1. For the good of the party and the nation and after carefully discussing the ruse with James Carville and David Axelrod, Hillary Clinton declares that her doctor claims she is suffering from exhaustion and must rest for six months. Joe Biden, after carefully discussing this chess move with James Carville and David Axelrod gallantly agrees to accept the duties of. State of State on a temporary basis. Hillary then demurely accepts the lower position of Vice President. During the Democratic convention of grass roots swelling of an unbeatable ticket of president Obama and Hillary VP Hillary Clinton grows from a groundswell to assume nominee. Joe Biden, after deep consultations with James Carville and David Axelrod determined that mathematically this creates a win win win situation as follows the Democrats maintain the presidency until 2016 Joe Biden as sec. Of State gains recognition and maturity in the eyes of the voters and will become a formidable candidate in the Democratic primary in 2016. Joe Biden’s presidential primary candidate will be the well-rested, matronly, statesmen-like Hillary Clinton. Let the wonderful battle begin. A battle that will lead to another four years of deep thinking, caring liberal President. 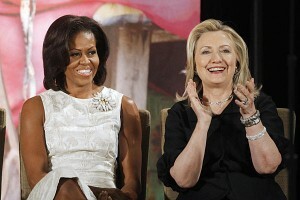 Symbolically, this switching of roles… Joe Biden and Hillary Clinton…is a life insurance policy which will allow Michelle Obama to remain a “Stay-at-Home Mom” and bring up two wide-eyed brilliant daughters.